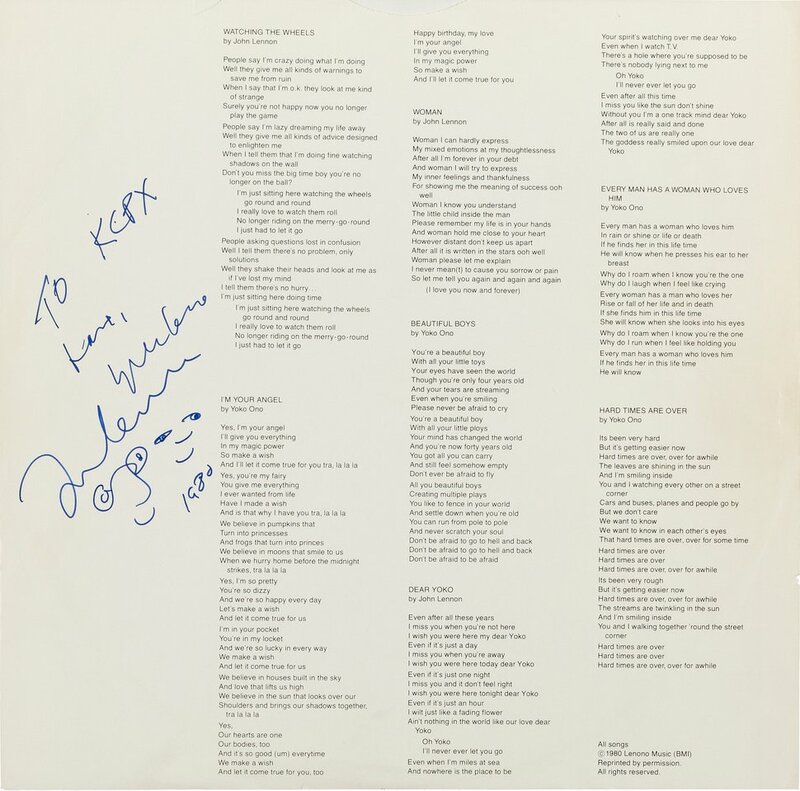 A promo copy of “Double Fantasy” signed for KCPX on Dec. 8, 1980, is on the block, with a starting price of $50,000. (Photo courtesy of Heritage Auctions/HA.com) A promo copy of the John Lennon/Yoko Ono album "Double Fantasy" was autographed for Salt Lake City radio station KCPX just hours before Lennon was murdered on Dec. 8, 1980. The album was just put up for auction, with a starting bid of $50,000. In the hours before John Lennon was murdered on Dec. 8, 1980, he and wife Yoko Ono posed for a Rolling Stone photo shoot with famed photographer Annie Leibovitz, sat for a radio interview with RKO’s Dave Sholin, went off to a recording session at the Hit Factory studio, and autographed a couple of copies of their joint album “Double Fantasy,” which featured Lennon’s first new music in five years. One of those autographs was famously for Mark David Chapman, the man who, a few hours later, would shoot and kill Lennon outside the Dakota apartment building at 72nd Street and Central Park West in New York City. Another was inscribed to Salt Lake City radio station KCPX. After 30-ish years of being owned by Utah-based DJ and former KCPX employee Gary “Wooly” Waldron, the album has changed hands a few times. This past Tuesday, it went online for a two-week bidding process being conducted by Dallas-based Heritage Auctions. Opening price: Fifty … thousand … dollars. And who knows where it goes from there. Bert Keane, then the national promotion director for Warner Bros. Records (which oversaw manufacturing, distribution and promotion of Geffen Records), accompanied Sholin to Lennon and Ono’s apartment for the radio interview. (Photo courtesy of Heritage Auctions/HA.com) Former Warner Bros. Records national promotion director Bert Keane penned a July 2010 Certificate of Authenticity explaining the history and circumstances behind the promo copy of "Double Fantasy" that was inscribed by John Lennon to Salt Lake City radio station KCPX just hours before Lennon's death on Dec. 8, 1980. The album is now up for auction, with a starting bid of $50,000. 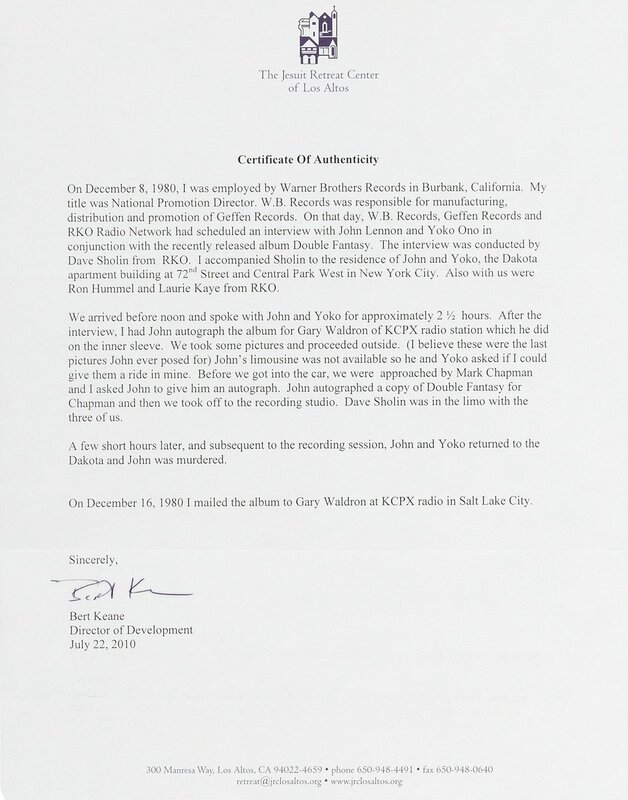 In a “Certificate of Authenticity” dated July 22, 2010, Keane detailed some of the day’s events and some of the history of the notched, promotional copy of the album. “We arrived before noon and spoke with John and Yoko for approximately 2½ hours. After the interview, I had John autograph the album for Gary Waldron of KCPX radio station which he did on the inner sleeve,” Keane wrote. (Photo courtesy of Heritage Auctions/HA.com) The inner sleeve of a promo copy of the John Lennon/Yoko Ono album "Double Fantasy" was autographed for Salt Lake City radio station KCPX just hours before Lennon was murdered on Dec. 8, 1980. The album was just put up for auction, with a starting bid of $50,000. Meanwhile, on Dec. 16, Keane mailed his autographed promo copy to Waldron, who had been planning to use it as a call-in giveaway. Obviously, given what had happened, that plan changed. (Paul Fraughton | The Salt Lake Tribune) In this 2009 file photo, Gary "Wooly" Waldron, a longtime Salt Lake DJ, holds his copy of John Lennon's "Double Fantasy" signed by Lennon just hours before he was murdered. Moon said that, in the 30 years he’s done that job, this album with Utah ties is one of the more unique items he’s come across. Furthermore, though he acknowledged the album’s personal inscription might deter some potential collectors, Moon is inclined to believe that will instead increase its appeal to others. And that history, that specific timeline, is what proved to be the crowning jewel for this album. It was signed by Lennon just hours before he died. That makes it incredibly special. Heritage Auctions put the album on its website and opened it to online bidding this past Tuesday. It will stay there until April 15, when it will be transferred to a “live” auction in Dallas, starting at whatever dollar figure it’s worked its way up to in the interim. The “live” auction can still entail live internet bids, but will also include bids placed over the phone, as well as those placed by prospective buyers appearing in-person. Moon, on the other hand, couldn’t say enough about it. The promo copy of “Double Fantasy” inscribed by John Lennon to Salt Lake City radio station KCPX went up for online bidding via Heritage Auctions on March 27, with a starting bid of $50,000. You can keep tabs on the bidding here. On April 15, it will be transferred to a “live” auction in Dallas, though internet and telephone bids can still be made at that time.